Johnny Wander at the Midtown Book Club!!! 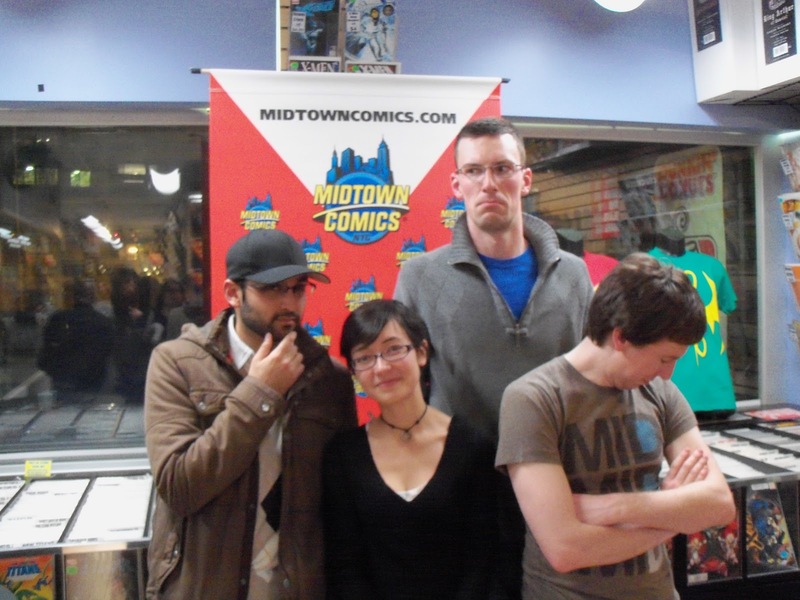 From left to right: Ananth, Yuko, John and Conrad. 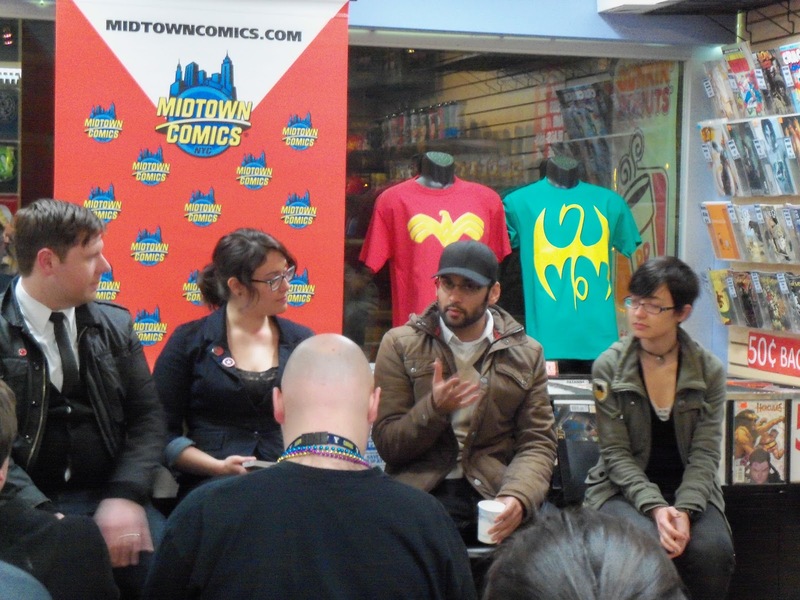 As always, I had a blast at the February Midtown Comics Book Club. February's book was Johnny Wander: Vol 1. The creators, Ananth Panagariya and Yuko Ota, were there to answer all of our crazy questions. I was also excited that John and Conrad (few of the books' stars) were in the audience. As always, Thor and Zoe hosted the affair to a packed audience! In case you haven't read Johnny Wander yet, it is a web comic that follows the real life antics of Ananth, Yuko and their friends. Yep, this one is totally true. It is written by Ananth and drawn by Yuko. While it doesn't have a storyline, reading it is like reading a comic about myself. It is cute and funny, and also something they are comfortable with their parents seeing! The two of them have been working on JW for 4 years. When coming up with the title, they chose Johnny Wander because it could be anything, not just a comic. That way, if they branched out to other ventures, the name still fit. Their original intent was that JW would be a side project. However, it became so popular that it's become their main source of income. Thor asked them why they went with a story a day rather than overarching plot, and Ananth said that each character is easy to pick up for new readers. Yuko added that time-wise it is easier to keep up with as well. Then they were asked just how they decide what makes it into the comics? Actually, some things don't make it because all of their parents read JW. Both of them said that they avoided using inside jokes to make it easier for readers to follow along. Yuko did say that they ask before they use a story. The stories that did make it in were lightened up a bit so they were funnier rather than dark. One story that fits this bill perfectly is the ant story. It is funnier because John admitted at the book club that he has a deathly fear of ants! Finally, I got to ask my question! At the beginning of the book, there is a very sweet quote that I just love. I wanted to know where it came from and it turns out that Yuko wrote it. As she puts it, Ananth has no rhythm, so poetry is just out of the question. On the flip side, Ananth did draw one comic, which looks pretty close to the rest of them. This was a super fun night, and now Johnny Wander made it into my web comics bookmark folder. Definitely check it out, you really won't regret it. The March book is The Stuff of Legend, and creators Mike Raicht and Charles Paul Wilson III will be there! Come on down and join us!